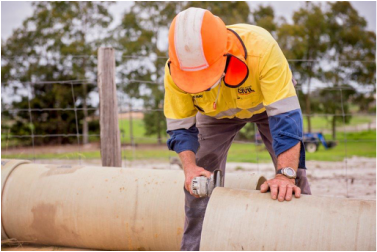 As Aqwest’s preferred civil and maintenance partner, Geographe Civil has an established relationship, however they still demonstrated value for money in a competitive tender process for the Emergency Bypass Network project. The network established a link between the water infrastructures of AQWEST and the Water Corporation within the Dalyellup Estate, to ensure supply in the event of a network outage. The project required separate network connections using specialised equipment and installation procedures, working around existing services in a public area and the coordination of multiple service authorities. During the establishment of service locations, two unknown Water Corporation pipelines were discovered, requiring an on-site redesign of the emergency bypass system to fit in with existing below ground infrastructure. The Emergency Bypass Network project was a first for the region, providing an integrated system and security of water supply for customers of both utilities.